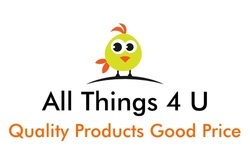 Conceived by Tracey Palmer, All Things 4 U was estabished to search the globe and bring to your finger tips quality products at good prices. Many of these products you will not find on the high street, the reason being that many are by specialist manufacturers who don't have a high street presence. Have a look at some of the best deals on the web under one roof. We are currently in negotiation with a number of fantastic suppliers and some of their deals will be coming to you soon, please come back; we are always on the look-out for new products just for you. And if there is anything you would like us to research, let us know..